A chance encounter between colleagues thousands of kilometres from home, one seeking answers to challenges in his country, another looking outwards to share experiences. It was April in Croatia, the WONCA World Rural Doctors Conference was in full swing at a convention centre in Dubrovnik, and where I first met Manabu Saito. Manabu an Emergency Physician, now General Practitioner, had sought his own training in gastroenterology and home care medicine, was travelling the world learning from other health systems. Australians are a rowdy bunch yet Manabu was brave, coming out with us to have a meal. It was there that we sealed a deal, Manabu would visit Emerald on his way to the National Rural Health Alliance Conference in Darwin. Rural people the world over have barriers to access to care, be it the great distances in Australia, the remote islands of japan, or the ravages of war in Croatia. Emerald is a rural town 1000 kilometres from Brisbane the capital of Queensland, and 300 kilometres from the nearest tertiary hospital. Like many rural towns in Australia it is a focus point for industry, cattle, agriculture, coal and cotton. It is a hub for education and school of the air, healthcare and administration. What sets Emerald apart is that it is also a young and vibrant community with many children as evidenced by the 400 births a year at the local hospital. 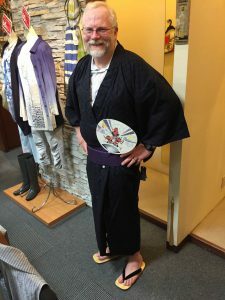 This is very different from the ageing and dying communities out west, a challenge that was to be found in the Japanese Islands as young people move to the city. It is my belief that one important contribution to a vibrant community is access to excellent care and good General Practitioners (GPs) and Nurses that people trust. Emerald has experienced its own trials, with obstetric service closures, reliance on locums to deliver care in the absence of a local medical workforce, and reliance on retrieval services. From the year 2000 to 2014 I was the only local GP obstetrician. A global question is how to improve the health of rural people. Even in Australia rural people suffer more from preventable diseases such as Coronary Artery Disease, Pneumonia and Chronic Obstructive Airways disease. Suicide remains a major killer of country people and the health of our first nations people does not equal that of the Australian community. Encouraging young people to invest in training to be rural doctors, nurses and other health professionals is a conundrum that challenges Japanese communities as it has Australia. This is the holy grail that Manabu came searching for answers too. In Queensland there is a new professional, the Rural Generalist (RG). A Specialist in a wide range of clinical skills that support rural and isolated practice. The model of nurtures rural school students into medicine, creating a premium pathway, that delivers an attractive quality experience. These young clinicians are taught an advanced skill of a procedural or non procedural nature, such as Obstetrics, Anaesthetics, Surgery, Population or Aboriginal health. What has resulted from the program has been an enthusiastic, highly trained and complementary health team with the expertise to look after rural people as close to home as possible, living and working in the communities they serve. Manabu was able to see this in action in Emerald, joining training sessions and speaking with young Rural Generalists about their role in Primary care as General practitioners, and their advanced practice. Later Manabu met the architect of the Queensland Rural Generalist Program Dr. Denis Lennox, and Professor Sen Gupta of James Cook University. The Rural Generalist system is the outcome of contributions from the Generalist Colleges Government, the Medical Schools, rural Hospitals and GPs. The Australian College of Rural and Remote Medicine (ACRRM) sets the training standards for the QRGP and the preferred qualification is Fellowship of ACRRM. Registrars may also elect to meet the standards through training for Fellowship of the Royal Australian College of General Practice (FRACGP) and the Fellowship of Advanced Rural General Practice (FARGP). Through the program Emerald has seen a reinvigoration of birthing with three more GP Obstetricians to assist me; young highly professional women. A Rural Generalist Surgeon performs common operations and gastroenterological examinations ably supported by 6 GP Anaesthetists. Each and every one of these young specialists also works in primary care as a GP. Central Australian and the NRHA Conference were introduced to a passionate crusader for rural medicine in Manabu’s subsequent travels in Australia. So four months later, I am sitting in the back of a Kawasaki BK 117 flying to Fukuoka to start the trip home from Japan. In the last five days I have shared the message of rural generalist training, the importance of a primary care workforce and the challenges that only well trained GPs and nurses can meet of an ageing population and the epidemic of chronic disease. A Rural Generalist Fellow, and Royal Flying Doctor Service (RFDS) medico, Dr David Morgan has shared the challenges of remote care with a number of audiences. His stories of the use of fixed wing aircraft is news to Japanese clinicians who almost universally rely on helicopters for retrieval; a great challenge for very remote island communities. Telehealth care is something that Japan is also yet to discover as a means of providing specialist support to rural doctors in decision making in emergency, and for routine care. Alison Kirby, a GP Anaesthetist and RG Registrar shared her passion for rural medicine and her commitment to rural Australia. Alison lives on a cattle station the same size as our final destination Tokunoshima, with as many cattle as the famed home of Bull Fighting. She is a true rural doctor, having grown up in the Bush then trained to return as a skilled Doctor. Alison’s enthusiasm was greeted with intense interest from the Munakata Medical Association and students from ten universities in the Kyushu area (including medical, nursing and pharmacy). Alison, David and I have been treated to a fantastic opportunity to immerse ourselves in the rich culture of Japan. In Fukuoka we challenged clinicians by presenting a workshop, showcasing some of the many skills required of rural generalists. We were impressed by the passion of Medical students, Doctors and in particular the community of Tokunoshima for change. The health system in Japan is quite different. Tokunoshima itself has three separate hospitals, including a 200 bed psychiatric hospital. The specialist led units see employment of 2 obstetricians for 200 deliveries yearly, quite the opposite of Emerald where generalists take on multiple roles. Opportunities to broaden the skill set of doctors and reduce the costs of needing to supply multiple specialists to small communities exist by application of a generalist model of care. My lasting memory will be of a young midwife at our last gathering. With a tear in her eye she asked what was the most important thing in our lives. Universally we agreed that looking after our communities and training those that came behind us was our passion. I think that Manabu and all the Japanese clinicians we met feel the same way too.